ESALA POYA: The Esala month is sacred for the Buddhists and Sangha, it was on the Esala Poya Day that the Buddha preached Dhammachakka Pavaththana Sutta to the Five Disciples, Baddhya, Vappa, Mahanama, Assaji and Kondangna, the First Sanghayanawa and the dispatch of the Sacred Bowl to Sri Lanka, Tunsinhale. It was on July 14, 1753, Venerable Saranankara Thera received the Upasampada or Higher Ordination from Siamese Maha Thera Upali and Maha Thera Ariyamuni at Visungama in Kandy. The events that led to the disappearance and the revival of Upasampada were due to several causes mainly on account of internal dissensions within the Buddhist Sangha Fraternity and the indifference of the people to uphold and non observance of the Vinaya the sacred rituals and practices. neglected. Of special significance was the threats, revolts, disorder, fear and instability of the Monarchy and the social pressures exerted by the Portuguese settlers in the maritime areas where the Portuguese held away. In Europe, Portugal and Spain shared the pre-eminence super powers over other countries. Portuguese marauding sailors were pursuing Moor traders in Asian countries for trading supremacy. The Portuguese and Dutch influence in the Kanda Udarata over the Sinhalese were such that the Sinhalese began to assimilate foreign customs, ways of life, dress and language resulting in transformation of their local life style. It was inevitable that these alien customs seeped into the Bhikku Fraternity as well. The Portuguese described the native Sinhalese and Buddhists as “heathens” and in the Sangha Fraternity, the concept, “Ganinnanses” were often symbolised for the Bhikkus. Upasampada or the Higher Ordination of the Samaneras who have mastered the Pali and Sanskrit languages, the Vinaya Rules were not unknown at the time King Wimaladharmasuriya I ascended the throne. The deterioration of the Vinaya and discipline amidst the wars with the Portuguese and the Dutch during the period of eight Kings ranging for 153 years were the primary causes for the instability of the country which directly affected the Sangha. Realising this unhappy situation, King Wimaladharmasuriya despatched a Mission to Arakan or Rakkhanga seeking the goodwill of the King to send Maha Theras to perform the Upasampada. In accordance with the Royal blessings Maha Theras Chandavilasa and Chandivakka led a Mission to Sri Lanka. The Upasampada ceremony was performed after a very long lapse of years. The next King Rajasinghe II who ruled for 52 years had to confront the Dutch in major battles in 1630 and 1638 at Gannoruwa and Randeniwela against renowned Portuguese Generals and the country was unsettled that the King had no time to give his utmost attention and devotion to religious activities and again deterioration set in. Being aware of the low standards to which the Sangha had fallen, King Wimaladharamsuriya II with the help of local chieftains conversant in Pali, another Mission was sent to Arakan to invite Preceptor and Teacher Bhikkhus to Sri Lanka, where the Maha Thera Sanghaka and Locarge arrived in Kandy and revived the Upasampada at Getambe. This was followed by another Mission during the Kingship of King Vijaya Rajasinghe under the leadership of Doranegama Rala to Rakhanga, Siam and Pegu, but the ships were wrecked near Peru. Ven. Saranankara Thera was not demoralised on account of the unfortunate situation but persisted that he himself should go to Siam. The King was not pleased but arranged with the Dutch to supply sea-worthy ships, for by this time the Dutch had become friendly and it was believed that the King had given permission to the Dutch to build a Church in Colombo. Ven. Saranankara Thera persuaded Doranegama Rala and Wilbawegedera to lead the delegation. The Mission had been to Batavia and only Wilbawegedera had met the King of Siam and even this Mission was unsuccessful. Undaunted by successive failures, Ven. 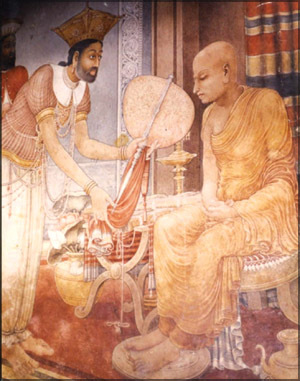 Saranankara Thera was determined to accomplish his - Mission to bring back erudite Bhikkus to Sri Lanka and revive the Upasampada, he persuaded the new King Kirti Sri Rajasinghe who was of Hindu parentage and married from a Nayakkar family in Tanjore felt and acted in pursuance of the wishes of the Sangha and people that if he were to rule in Sri Lanka, he should become a Buddhist. King Kirti Sri Rajasinghe, aware of the local conditions followed the visions of King Parakrama Bahu in making Sri Lanka and his kingdom prosperous and also devoted his time in renovating anicuts and ruined vihares, temples, shrines and Kovils. Buddhism began to gain ground so much so that he encouraged the successful Mission to Siam headed by Ellepola Mohottala, Wilbagedera Naide, Pattapola Attapattuwe Mohottala, Eriyagama Muhandiram, Attaliyadde Muhandiram with 67 persons left Trincomalee on August 1, 1750 to meet the King of Siam with Royal credentials. Although the journey was perilous due to stormy weather the Mission returned to Sri Lanka with Siamese Maha Thera Upali and Ariyamuni. The King and Ven. Saranankara were very pleased and on the Esala Poya Day in the presence of the King, Venerable Saranankara, Kobbekaduwe Unnanse and four other Bhikkus received the Upasampada at Getambe Sima Malaka. The Siamese Nikaya founded by Ven. Upali Thera and the Bhikkus of the Siamese Chapter owe so much to the indomitable efforts of Ven. Saranankara amidst enemies within the Court which at one time got an Order for banishment to Laggala, prevented only by Ven. Saranankara Thera’s exemplary character, high standard of learning Pali, Sanskrit Suttas and the devotion to uphold the Vinaya and scholarship. Ven. Saranankara Thera began writing Buddhist books, such as Satara Banavara Sannaya, Muni Guna Alankaraya, Maha Bodhi Vamsa Sanna, Rupa Malawa and Pali Sandesa. The Gedige Viharaya at Asgiriya where Upali Maha Thera resided holds the Katina Pinkama yearly. Gedige Viharaya has been selected Vihare for Royal grant by the King of Siam. Ven. Saranankara Thera was conferred the title of Sangharaja of the Siamese Nikaya and thereafter the continuity of Vinaya and Upasampada ceremonies are held annually. Ven. Saranankara Thera passed away in Kandy on the Esala Poya Day in 1778 and cremated at Dalukgolle Temple Cetiya in 1778. The Bhikkus of Sri Lanka and the Buddhists in general owe their greatest respect and devotion on the preservation of the Buddha, Dhamma and Sangha to Ven. Weliwita Saranankara Sangharaja Thera.